Back to normality after NYFW and LFW, this week has been slightly more relaxed but no less busy! It’s been a great week for catching up with friends, eating out and enjoying the first proper sunshine of the year! … Spending Sunday afternoon enjoying Afternoon Tea at the Shangri La. Last Sunday, us girls got together to enjoy the Afternoon Tea at the Shangri La hotel, up on the 35th floor of The Shard. Between us we shared 4 of the Classic teas, and two of the Asian afternoon tea’s complete with mini Gyozas, dumplings and spring rolls! I’ll be reviewing the fabulous afternoon tea in a blog post very soon, so keep a look out for that! … Looking after the gorgeous Maple! And planning how I can kidnap her cos I’m never going to be able to give her back! Maple is a beautiful Vizsla puppy, and Charlie and I got to take care of her at the weekend while her Mummy and Daddy went skiing. She is definitely a good luck charm for Charlie’s rugby team, as they beat the other team 43 – 8, and Charlie scored a try! Think we will have to take her to every game! … Blog planning with FrockMeImFamous. 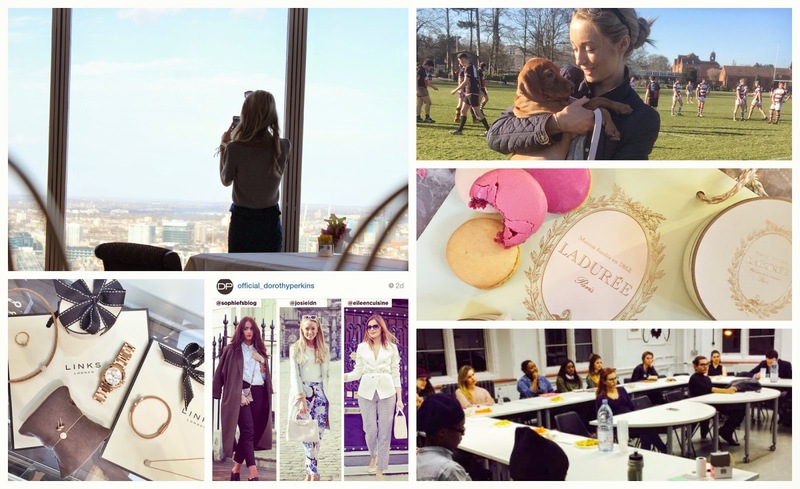 We spent a sunny day together shooting and planning some exciting blog things… all will be revealed very soon! We couldn’t resist popping into Ladurée after our shopping trip to The Royal Exchange! … Giving a talk about blogging at the London College of Fashion. I was invited by the team at Comb to talk at their Social Media Workshop, which was attended by students and bloggers alike. You can read a little more about the event in this article, written by The Haggerston Times. … Part of the Dorothy Perkins #StyleHeroes campaign! The lovely girls at DP sent me a pair of fabulous crop trousers and one of their new mini bags to style up. They shared my pictures in their email campaign, and also launched a competition on Instagram for you to vote which blogger styled the trousers and bag the best! If you havn’t already, I’d love it if you would head over to the Official_DorothyPerkins instagram and vote for my outfit! … Mother’s Day shopping at The Royal Exchange. I can’t believe I’ve never been here before; right in the heart of London, close to Bank station, The Royal Exchange is a stunning building which houses some of my favourite brands, and those that I know mum will love too! Find out more about my day there on this post here.